Fall is in the air here in New York. The days are getting shorter, school is starting up, and our calendar is filling up with fall activities. I love fall – it’s truly my favorite season, so I’m excited for the changes that are coming. As we start the school year here, I’ve been making sure my boys get a hearty breakfast to start their days. I need them to make it through to snack time! 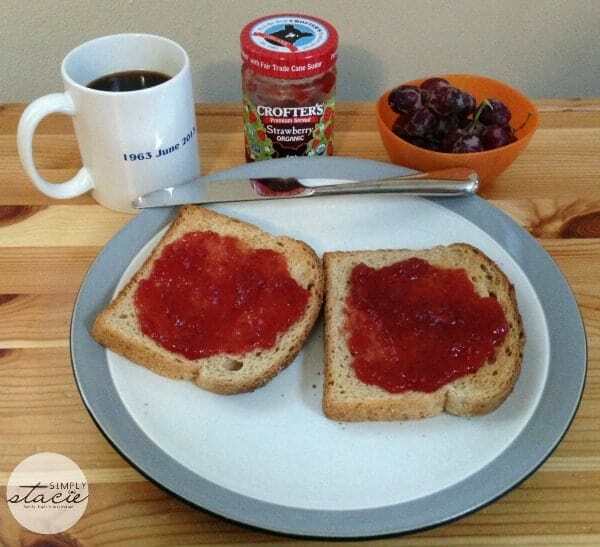 I’m lucky in that my boys are always up for trying something new to eat, so I was happy to be able to share some yummy Crofter’s premium spreads with them as part of our breakfast routine. 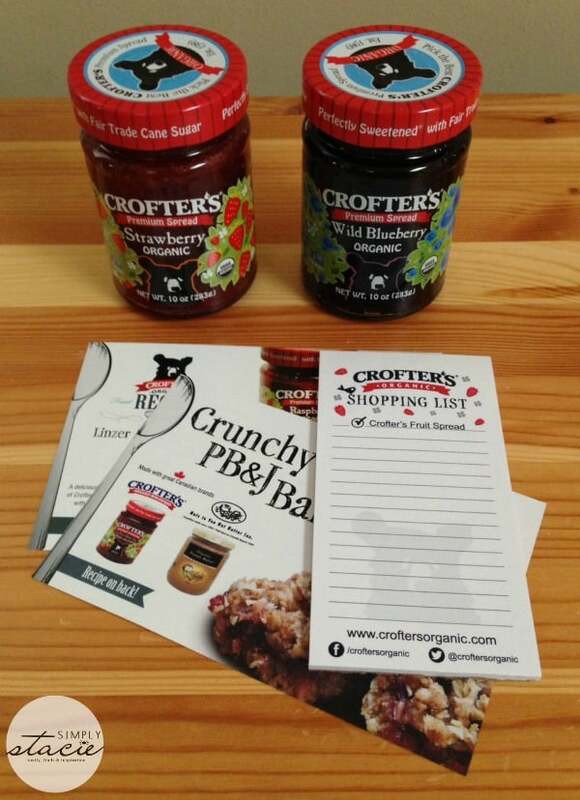 We received two Crofter’s premium spreads for review – Strawberry and Wild Blueberry. I was immediately impressed with how smooth these spreads are – and the taste is absolutely out of this world (think “eat straight out of the jar with a spoon” yummy!). We tried the strawberry first on our wheat toast. One bite and I was hooked. I love the taste and the texture of these spreads, and so do my boys. Beyond being so tasty, these spreads are organic, non-gmo, and nutrient-rich. They are made with only the finest ingredients and and only 30 calories per serving (so I didn’t feel guilty about my diet!). They also have 1/3 less sugar than traditional preserves. I love foods that taste good and that I can feel good about serving to my family – these spreads certainly fall into that category. I’m excited to try their other flavors – the apricot and concord grape sound especially yummy. Beyond toast and bagels, these spreads are also ideal for use in cooking and baking. They even have a dedicated Recipes page filled with great ideas for using these spreads in everything from appetizers to desserts. The jars I received for review have an MSRP of $3.99 each. Crofter’s was established in 1989 and is a family-owned organic food manufacturer located in Parry Sound, Ontario Canada. They are a company committed to making the best tasting, most nutritious, organic fruit spreads possible with 1/3 less sugar than traditional preserves. They support your right to know what is in your food, so you can trust that they only use the good stuff in their certified organic, Non-GMO Project Verified fruit spreads. To see the full line of Crofter’s goodies, visit their website. You can also find them on Twitter and Facebook. You can use their Store Locator to find them in stores near you (I was thrilled to find out there are over a dozen stores near me that carry Crofter’s!). I’d love to try their Concord Grape jelly….I love me some grape jelly! My favorite jelly is grape jelly. So, I would want to try their grape jelly. I would like to try the Just Fruit Strawberry! I want to try the Just Fruit strawberry. i would like to try the just fruit strawberry, it sounds amazing. I would loe to try the superfruit fruit spread or the blueberry one. I would love to try the Raspberry Premium Spread! The Seville Orange sounds good. I would love to try the Raspberry Spread! Another Crofter’s Organic product I think would be great to try is the Seville Orange Spread. This would be excellent in some recipes I have. I would love to try the Premium Raspberry Spread. The Morello Cherry Spread sounds good! I would like to try the Just Fruit Raspberry. I love Raspberries and these are organic too! So awesome! Thanks for the info on this cool company! I would love to try the Just Fruit Strawberry. I would like to try the superfruit spread..
Just fruit Strawberry – yum!! I would like to try the wild blackberry spread. The superfruit spreads look wonderful and good for me. We’d like to try the North America Superfruit Spread. It sounds amazing. I would like to try the morello cherry spread. Their Just Fruit Strawberry sounds delicious! I would love to try that! I would like to try their Just Fruit Strawberry. I’d also love to try the Just Fruit Strawberry. I’d love to try the Asia Superfruit Spread. I looks and sounds incredibly yummy! We go through so much jam and jelly with two growing teenagers, would love to try the blueberry. I’d like to try the Apricot Fruit Spread. I’d love to try the Seville Orange just fruit spread!